"Nürnberger Lebkuchen" are just one of many types of German gingerbread popular at Christmastime. They have been baked in the city of Nürnberg since 1395 by the local monks. The spices had to be imported for all Lebkuchen, so cities with strong trading partners had an advantage over small, agricultural villages when creating new types of Lebkuchen. Nürnberg also had good honey production and this gave them an edge up in commercial production of their Lebkuchen, which began in the 14th century. In 1643, the city even created the "League of Lebkuchen Bakers". "Oblaten Lebkuchen" are lebkuchen baked on individual thin wafers (one wafer to each cookie) to keep the soft cookie from sticking to the cookie sheet. However, since these wafers can be hard to get in the USA, as an alternative, line your baking sheets with parchment paper and bake the lebkuchen on top of the parchment paper. "Nürnberger Elisen Lebkuchen", considered the finest kind of Oblaten Lebkuchen, must have a minimum 25% nuts and less than 10% flour by weight. Sometimes, the recipe includes marzipan. These are soft, moist drop cookies. 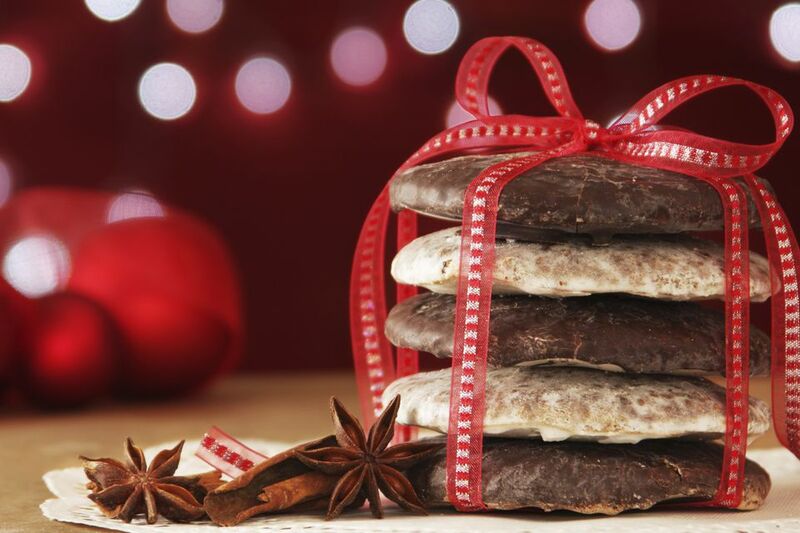 Buy the "real thing" at Nuernberger Lebkuchen Online. For these soft, Lebkuchen cookies, you will need the ingredients found in this Lebkuchen recipe. After making the cookies, they are coated with a delicious rum sugar clear glaze. You will find the glaze recipe in the next steps. The dough is made by beating the butter, sugar, and eggs together until creamy, then adding the sifted, dry ingredients alternately with milk. After the last addition of milk, the dough looks like soft brownie batter. The last step is to fold in the nuts and candied lemon peel. The dough becomes lumpy but still soft. Lebkuchen recipes traditionally call for Lebkuchengewuerz (spice mixture) or Neunerlei spice mix. Make your own: here is a very simple recipe. Would you like to see more about Lebkuchen Spice Mix? Once the tray is full, use the back of the spoon to fill out the circle, slightly mounding the dough towards the center. If the dough seems too sticky, wet the back of the spoon with water. If you are using "Oblaten" drop the dough onto the wafer and smooth to the edges, mounding slightly in the middle. Baking the German Gingerbread or "Nuernberger Lebkuchen"
Bake at 375°F for 15-20 minutes. Turn down oven to 350°F if cookies are browning too much. You will see that the cookies puff up nicely and become smoother and rounder after they are baked. Let cool for a few minutes, then remove to a cookie or cake rack to cool. While the cookies are cooling, start the glaze. Place 1/2 c. white granulated sugar and 1/4 c. water in a small saucepan on the stove. Bring to a boil and boil for a few minutes. Add vanilla and liqueur or rum. Sift powdered sugar over hot sugar syrup and stir. Note: You do not have to glaze the back of the cookies if they are baked on "Oblaten" but it's recommended to glaze the backs of parchment baked cookies to keep them moist longer. In that case, you will need a double batch of glaze. Use this glaze hot to warm. If it becomes too cool, reheat. Be very careful when you are holding the cookies to not burn yourself by dripping hot glaze on your hands. You might want gloves or mitts that you can wash afterward. Using a pastry brush, brush warm glaze over warm cookies while they are sitting on the cooling racks. Let dry completely. If you are glazing the bottom side of the lebkuchen, after they dry, flip them over, reheat the glaze and coat the other side. Dry glazed cookies for a day or so (to dry the glaze so it stays a bit crunchy) then store in an airtight container or freeze. These cookies are softer and moister than store-bought cookies. One reason is that they are so much fresher than the ones you buy. German industrial bakeries start baking Christmas goodies in the summer months, so all the purchased products are designed for a long shelf life. These cookies will keep for 10 days on the countertop in a tin, or wrap and freeze to keep them fresh longer. These are great additions to your Advent's Teller (Advent Cookie Plate) or to surprise homesick Germans with at Christmas.